i didn't feel particularly satisfied with the way i had prepared my group for the climb. unlike the previous TC in malipunyo, we just had 3 meetings prior to our departure that uneventful thursday night, and i had to miss out on one of them. when i first looked at my list of trainees, my immediate reaction was: the line-up's a little healthy, but this should be fun. bumps were scattered all along the road to TC3: malvin pirated 2 of my members on false pretenses, rendo backed out at the last minute, and there was a very confusing last-minute rigodon that reflected much lack of coordination among the folks who run the BMC. rhyan proved to be my savior. i had to SMS him several times to ask if he was going to join my group. and when he was finally certain, my next question was: what's your tent? and even before i could ask him, he very gamely volunteered to accompany nette. the battle plan was very hurriedly made, but grounded, nevertheless, on sound principles espoused by sun tzu. i already knew the "enemy" and "myself", since i had been this way before. so i felt that "victory" was mine to claim. the enemy, of course, is not the mountain, but the challenges along the trail as well as our personal limitations. and myself referred not just to me, but to my entire group. victory didn't mean conquering the mountain -- but achieving the goals (in this regard, the itinerary) you've set out for yourself. with this healthy dose of optimism, we took a long and cold bus ride to aritao. i had difficulty visiting the land of dreams, because the film united 93 by paul greengrass, a docudrama of the (supposed) heroism of 9/11, was showing. at this point, nette told me: "ngayon ko lang narinig yung 9/11. ano ba yun?" "competitor yun ng 7-11," i replied. as the movie played, i would weave in and out of a shallow slumber. nette was encroaching on my part of the reclining seat, and i was nearly pushed to the window. earlier, i had volunteered to adopt her and kim in my tent -- in all the previous B2k6 TCs, i've always had 2 other girls in my tent, and we all slept rather comfortably, and i didn't feel ill at ease. but now, i doubted whether there would be room enough for all of us. i amused myself with the knowledge that the nipping weather on the mountains of the cordilleras welcomed crammed conditions. upon our arrival at the shell station in aritao, we loaded our packs onto the truck. 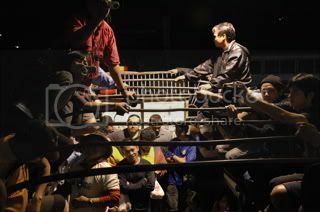 there were precious few seats on the enormous vehicle, and most of us had to be herded like cattle onto the back, and our bags were piled, one atop another near the front. i quickly occupied the roof above the driver along with janet, which necessitated some very agile movements, dodging branches, and ducking from low-lying wires. the road towards kayapa has so far evolved from my last visit to ugo. while there are parts that are still rough, a good stretch is paved with smooth concrete. and a bridge now stands, crossing the nearly-dry riverbed. a few minutes before 8, and we were already ordering breakfast at a carinderia in the public market. since this was a training climb, the jump-off was going to be the steep trail a few meters away from the humbly-built municipal hall. 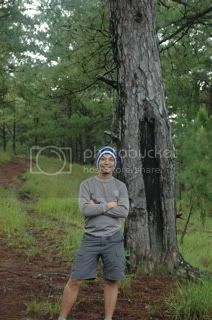 previously, the pangawan trail, a little farther up the road on the way to baguio, was where i started the trek. we moved gingerly up the trail, moving with little haste. there was much to appreciate along the trail, as the hulking green shoulders of the mountain ranges rolled off into the distance, capped in many parts with imposing peaks. we also innovated this climb with a map-reading activity, although this part, quite honestly, left much to be desired, as i violated many times, my rule not to do the triangulation for the trainees. but many of them came unprepared, not knowing where to start. we pushed ourselves up and stopped only on occasion to do the map-and-compass activity. it was a hot day, and the sun was beating down on us with much intensity, although dark clouds were hedging us from both sides. i followed kim closely, her bright, red backpack cover drawn with hibiscus flowers bobbing up and down in front of me. then, at around 11am, it started to rain. i do not know, sometimes, what to make of rain during a trek. often, it is seen as an ally, because i tire less when i'm wet. but i see it also as a boon, particularly to photography, and when it makes you cold and you slip many times because of the mud. finally, just a shade before noon, we reached indupit, in time for lunch. i whisked out my jolly hotdog and a jolly chicken torpedo, and munched quickly while inside the community chapel. i asked my team to load up on water -- i was already burdened with more than 5 liters of water (not including a liter of vodka, and 750ml of fuel). i informed my group that between indupit and the fourth waiting shed at the start of tey's revenge, that there will be little to fear in terms of battling gravity. for certain, it was a leisurely walk, with the terrain, dropping down many hundred meters down, and rising again many hundred metes up, always painted with different hues of green -- at times myrtle, at times viridian -- while the sky was a swirling cavalcade of somnolent dark clouds. at the second shed, we encountered cattle. they had blocked the path, and weren't keen on giving us the way. they're not the usual kind of cows you find depicted on a milk drink. their colors were either brown or black, some cream. while they didn't have the alarming horns of the brahman that chased me in batanes, i didn't want to risk disturbing these cows, lest they trample upon me with their hooves. besides, i was the one invading their grazing spaces. little did i know that the best way to let them go away is to just clap. finally, we reached the third shed. the summit was already visible in the distance, swathed in a wet, gray coiffure. but the trek leading to the fourth shed was going to be the longest. we continued without stopping. by this time, the mud had soiled my pants up above my knees. upon reaching the fourth waiting shed, the groups were already taking out their headlamps and raincoats for the storied ascent that we call tey's revenge. i shunned the poncho, thinking it was deep inside my pack, and posturing myself too macho to be needing one. i've never worn a poncho during a trek, actually. but this was different. as we planted one foot after the other on the slope leading to the summit, a thick fog and an unrelenting cold wind swarmed in on us from all fronts. it wasn't as difficult an ascent, as i had dreaded, although a cramp was possibly knocking on either of my legs. before long, i was feeling too cold to even stop momentarily. when jhoana complained that she didn't know the way, i volunteered to lead the pack. i just said "follow me", and trekked without talking through the thick forest after the clearing where i last camped, leading to the summit. then, not far away, i heard TB's voice and caught a glimpse of his lamp. he pointed in the direction of the mt. ugo marker. he said the campsite was that way. behind me, the trainees were only starting to emerge from the dark shadows of the thick forest. i started to shiver, and my feet shuffled quickly towards the direction of the arrow on the ground. past the sign, the trail disappeared underneath ferns and grass and shrubs that clasped down high above me. i fell somewhere here in my haste. then the plants disappeared, and before me were lonely trees scattered along a gentle slope. i had hoped to see signs of camp, but no. i found it a little down the slope. 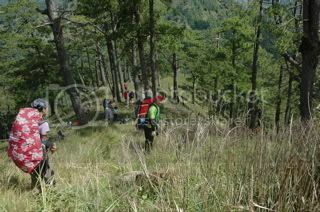 when i reached the camp area, i quickly tried to locate space for my group. there were precious little flats in the area, and some groups had reserved places for their tents even when their tents weren't there still. the ground was completely uneven, as though a machine had plowed through them. much later, we would discover that the culprit behind the bumps were cows. when i identified a spot, i waited for kim and dexter to arrive. and they did around 10 minutes after i did. by this time, i had already worn my poncho, which, after all, i tucked into one of my bag's side pockets. i pitched my tent. 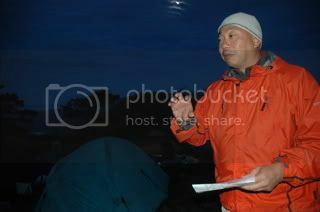 normally, i would hand over my tent to the trainees, and just give them instructions. but i am not completely irrational, and the situation called for a different tact. i just asked both of them to hold a piece of tarp above me while i put my tent together. in around 5 or so minutes, my tent was already standing. nevertheless, it was a little damp inside, but not flooded, at least. i told kim and dexter to change while we waited for the rest of the group. 10 minutes later, aries and ai arrived. i helped aries pitch his TNF heron 23. then, a few ticks after 7pm, and just a shy off the IT, the last of my groupmates arrived. the same process: with the trainees holding up the tarp, rhyan pitched his brand new blue TNF tadpole 23. i also did the kitchen tarp, employing many of the learnings that i have acquired in the many climbs i have had in the past. my group had 3 trekking poles, so it wasn't absolutely necessary to find sticks to set-up our tarp. other AMCI members, drunk perhaps on the idea that they are masters in the training, would not have lifted a finger to do many of these tasks, but i have an altogether different tack: if my own comfort and enjoyment would be compromised, then i had better do it myself. when all our tents finally stood, neatly lined one after the other, i began my tirade of elitist jokes about us being the north face avenue, an upscale neighborhood, while everyone else shacked into poor, rundown shanties. of course, this mingled with the earlier joke that we were the pugad baboy group, that our group's combined weight was more than any of the other's. at this time, the rain stopped, and the sky started to clear. the moon, which was full just the previous day, was glowing behind a few straggling clouds, and threw a dark blue cast over the horizon. but just as the rain disappeared, the cows appeared as well, almost as though they'd been summoned by the moon. they went about eating grass here and there, threatening our tents and any of the things they could possibly munch on. i tended to dinner, and fixed our group one of my classics: a nasty chili con carne sans the spicy spike. "this has been the most satisfying meal i've had in a climb," kim said, midway into her mess kit. the rest merely grunted in agreement, too busy perhaps bringing their spoons to their mouths. it was, in fact, a really good meal which we finished with a nice fruit salad. after dinner, we started on the tequila. there were only a few visitors to our tent, and i guess, after the 10-hour trek, the team was a little exhausted. i had gone around the campsite to see what was going on with the other groups, but many of them had checked in early for the night. what a bunch of wimps. so although there was a no lights out rule for the evening, i still slept early, just before 11 pm. i found my space a little too cramped, that i had to sleep sideways. 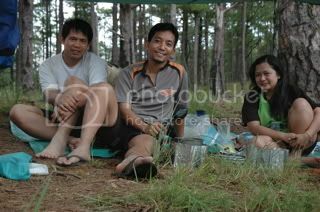 the next thing i knew was my tentmates, nette and kim, rousing to shoo some cows that had invaded our area. i wanted to tell them to just go back to sleep, but i heard a ghastly moo as though it had been shouted into my ear. still, i didn't budge until a few minutes after wake-up call. the whole team was already busy with heating water for coffee. they fumbled with my stoves a little, but they were both up and running and i preoccupied myself with photographing the campsite which appeared unreal in the blue morning light. for breakfast, we had tuna and cheese omelet. breaking camp was a little slow, though, and i had to restrain myself from nagging my trainees too much. previously, i had been warned about dexter as being major pain: lazy, unwilling to contribute, with primitive ideas about gender-specific tasks. generally, not a team player. it was hearsay as far as i was concerned, and that ought to be underlined since he one of my brethren in the bar. but while i was willing to give him the benefit of the doubt, i was nevertheless thinking of a script at the back of my head in case he did turn out to be pasaway. surprisingly though, he worked without being told what to do, and without complaining. i knew that the trek to the old sawmill and then to lusod was one paved with great views and a leisurely trek. but then again, this was, after all, a training where the trainees had to build on a discipline. 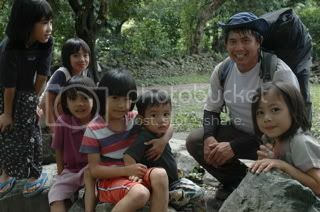 after some photos at the campsite, we proceeded to trek up to the marker. we had a group shot there, which nearly went awry, since after pressing the timer on his camera, rhyan leaped without looking, and fell into the hollow just in front of the marker. it is a huge hole, possibly 6 feet in diameter, and around 4 feet deep, populated by plants of all kinds. he fell there, and we all stopped for what seemed like eternity, and the next thing we heard from him was an "uy". immediately after that, we all broke into irrepressible laughter. after that short episode, we proceeded to the bigfoot memorial, which stood at the base of a steep descent that was hedged by the sharpest blades of grass. my fingers and palms were nicked in several places. we emerged from the grassy slope and reached an area rife with photo opportunities. photoshoot here, photoshoot there. at this time, ike, who was a little ahead of us, from out of the blue, reminded me of something which i would rather forget about. he mentioned, probably because he thought i would be amused by it, that he was the one responsible for editing a BBBS picture, superimposing my face on 2 kids. i was not at all happy with the result, and was less happy that the person responsible for it was someone who didn't know me at the time. i told him, i'll kill you ike! and he must've thought i was kidding. less than 10 minutes later, we reached the group resting near the bigfoot memorial, where we remembered AMCI members who had gone ahead of us. the memorial -- a humble assembly of charred wood, rocks, acorns, and friendship bracelets -- was made in memory of bigfoot yanga, one of the most loved sweepers of AMCI, so-called because he hardly wore shoes, even in the toughest of climbs. it was already way past 10am, and then we rushed towards the lunch area with haste. although we were the last group to leave the campsite, we were nevertheless the first group to reach the lunch area. the old sawmill might itself look like a campsite. it sits in the middle of an area where huge pine trees stand like sentinels of a long lost memory. not too far away is a structure -- sleeping quarters perhaps. 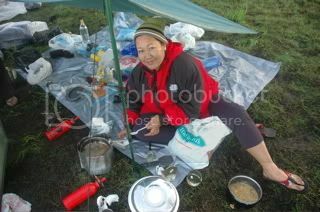 by the time the others started trickling in, we had comfortably taken off our shoes, had set up a tarp, and were busy cooking lunch. other groups had opted to eat packed lunch, but we wanted ours piping hot. the downside, though, is that we had to pack again for the trek to the campsite. for lunch, the guys cooked rice, and i took care of the pork teriyaki, which i sprinkled with sesame seeds, and what else. we also had potato wedges garnished with herbs. a quick yummy lunch in a nice place. then we walked towards lusod. the path is winding on red earth covered by browned needles of pine. trees were scattered all over, although it is characteristic of pine trees to be wispy, unable to blot out the sky. in just over an hour, we reached lusod to refill water. here, we were received by bossing. and here as well, i received most shattering news: the barangay councilor hadn't stocked on anything, and we were left dreaming of coke. after loading 4 liters of water, we started our trek to bajay's campsite. 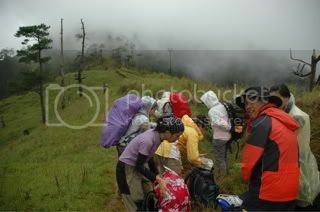 just after the rice paddies, just beyond the short ascent, it started to rain. before me, the terrain unfolded. the narrow, muddy brown path snaked into the fog in the distance. pine trees that grew randomly were sparsely scattered in all directions. there were steep slopes on either side, although no views could be seen. after around 20 minutes, i caught a glimpse of the campsite. it was still raining. but at least, it was still a little early. when the rest of my group arrived, we started pitching our tents, with our kitchen in the middle. we were warned that we had tied our clothesline onto a haunted tree. i believed in no such nonsense. just before 5pm, nette started on her meticulous dish, which she simply called pasta italiana. it had a really complicated list of ingredients, and her methods were just as numerous. she started with the fresh tomatoes, and the herbs, and the garlic, and the onions, and the pre-cooked beef. just after nightfall, with all 7 of us cramped underneath the low-lying tarp, nette's glorious pasta creation was starting to take shape. i remember meeting nette at the diagnostics, and i had to hold back a mix of disbelief and amusement when i first saw how big she was. she most definitely looked like a candidate for giving up early, or at least, for being regularly in the company of the sweepers. but that she was there, at the 2nd campsite, on her 3rd training climb, was a testament to her sheer grit and determination, her "pouch" notwithstanding. and finally, dinner was served. at half a kilo, there should have been more than enough. but we gorged the dish like there was no tomorrow. suddenly, bing's expensive puttanesca was relegated to a near second. this was a really really mean pasta dish. i loved it and probably had too much. so loved was it, that we almost completely forgot that we had dessert. by the time we had discovered the lemon squares, we were already through with the half liter of jose cuervo tequila and had started on the absolut mandarin vodka. only the best alcohol for the most upscale neighborhood in bajay's campsite. every now and then, neighbors would drop by, asking for salt, oil, onions, garlic. we'd started our socials, and yet others were still not done cooking. but we were generous with our drinks. we crammed ourselves into that small space while it was gently drizzling. i wasn't feeling cold, and laughter floated in the air amid stories and sharings of our triumphs, travails, and trails. it was a steady evening which i was enjoying immensely, and which extended till very late in the evening. before i even noticed it, and while a rather serious discussion about BMC ensued, noise started to gather in a nearby corner, as xenon announced his top 5. our group wasn't interested, since we were having a great time all our own. i kept hearing my name called out. it was janet, apparently, and she had gotten rather out of hand. more than 5 times, malvin and eubert came to me and pleaded that i take her to her tent and get her to sleep. i didn't want to because i worried about getting wet. but when janet dove into our campsite, tipped over our camplamp, tripped over our guylines, and generally made a silly, embarrassing mess of herself, i had to intervene. i pulled her out of the circle and brought her into her tent. she was guzzling barely intelligible remarks about her expensive TNF thermal pants which had been singed, complaining about the weather being too hot, and saying that she was about to barf. she was so completely drunk. i saw her suunto advizor somewhere and strapped it into her wrist so it wouldn't get lost. a little while later, leo was brought to the tent. he snuck his head in, looked at me, and asked, "sino ka? tent mo ba to? pwede makitulog?" he entered the tent, still in his wet poncho. i took it off, and then wiped his very muddy feet with a towel i found inside. yes, i am such a devoted slave. i'm used to babysitting drunkards. so there i was, in a small dome-type tent, with 2 drunk people, and pie. i told her to sleep between them, and as i made myself out, leo mumbled something, and appeared to be on his way to sleeping. i returned to my area. we still had alcohol. we finished it and were rounding up our evening. earlier, i had already sent nette crawling back to her tent. bajay asked how my group was and gave him a thumbs up sign. he said that the socials was turning unruly, and that he was going to call a lights out. i started to fix our kitchen. then, somewhere in the distance, very audibly, i heard sheena berating bajay that he was not the TL, and the tonyboy cutebalddiver had said that there were no lights out. after a while, all else fell silent, and i was already inside my tent. nette was already fast asleep, snoring gently, producing sounds not unlike when you're clearing your throat. i worried that the noise would prevent me from sleeping, but the moment i laid my back on my thermarest, and with the aid of a mix of vodka and tequila, i was soundly asleep that evening. i woke only later when either nette or kim needed to go for a minor. i mumbled something, half-awake and half-asleep. when you're prostrate on comfort, the likelihood of waking in the middle of the night for no particular reason isn't too high. they left my tent and probably started on breakfast, even before TB blew his whistle to announce the wake-up call. by the time i decided to rise and shine, my MSR whisperlite was already humming as rice cooked. i basically just went around the campsite, said hello to the people who were drunk the previous evening, and admired the peaceful warmth that had descended upon the campsite, after a noisy evening filled with raucous laughter. our breakfast consisted of really great-tasting palm corned beef. 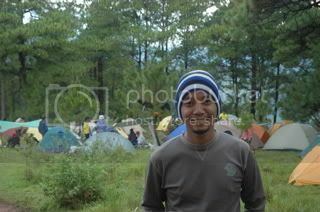 while i was very satisfied with our meal, i also had occasion to visit other campsites. i tried the focaccia bread in francis's camp and the cold cuts and white wine in malvin's. then, for the first time since we set off for the climb, i heard the call of nature. i had to take a major major, and i heeded it. along the way, i found janet, sitting on a pine stump, forcing herself to belch out the poisons from the previous evening. not far from her, i sat and contemplated the universe. but my concentration was disturbed by claire and jaybee. "shoo! go away!" i told them, and finished my business. how embarrassing, to be seen in the predicament. after that, we began, once again, the tedious process called breaking camp. it was again pretty slow by my standards, but i patiently waited on my wards to dismantle the campsite and leave it as we found it. one by one, the spaces had been cleared. the tents had been folded, and the scattered cigarette butts had been picked up. from the chaos and the order of the previous day, the campsite appeared once again as one would find it without campers: a green, flat pasture with enormous trees. 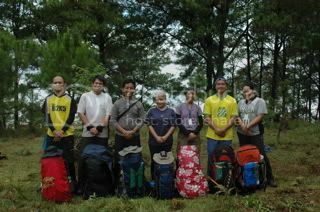 after a group photo, we started our trek to tinongdan. it was already 9am, but i knew we'd still make it in good time. we walked gleefully to our wash area. without the burden of over 5 liters of fluids, my pack was decidedly less heavier. we took the opportunity to make many stops for photographs along the way. the descent was just magnificent, with ravines and the duplicating ranges unveiling themselves in the distance. we didn't hurry -- that was unnecessary. rather, we just allowed gravity to take its course. it was an easy trek. hot, but without too much pressure to finish sooner than necessary. the banghouse was clearly within reach. before long, we'd reached the community, where kids were in attendance to welcome us with their mellow, inquiring eyes, and their innocent, sincere smiles. these are very beautiful kids indeed. 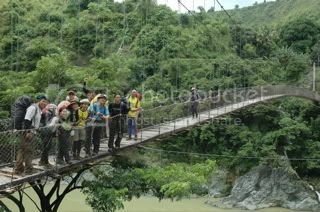 after the community, we crossed an immense hanging bridge -- perhaps the longest i've crossed. 5 minutes from there, we'd found jeepneys waiting to take us to the barangay hall. i opted to stay behind, wait for the rest of our group, and clean up behind the store. they'd very hospitably offered an area beside a pigpen and covered by patches of rice sacks, as our makeshift wash-up area. at the store, aries decided to buy everything that was cold and could be imbibed. we were given 9 sun-glos and 2 packs of yakult. deal. at around 2pm, we finally finished taking our individual baths, and the jeepney chugged and pulled to bring us to the barangay hall perched high above, overlooking the rest of its constituents. from the top. many several peaks jutted in the distance. one of them must be mount ugo. we had lunch at the hall: basic, but hearty nevertheless. the barangay chairman spoke about the history of mount ugo. we were all just very sleepy. the ride back to baguio was just over an hour, and we were all delivered to the victory liner bus station a little before 5pm. we deposited our bags there and decided to meet later at o mai khan for dinner and post climb. since it was nette's first time in baguio, we took her to the market, where she insisted on buying broccoli and fresh strawberries. it was too late though, for the latter. then we walked our way to o mai khan. the meeting went smoothly, even as i once again experimented on the mongolian barbecue. 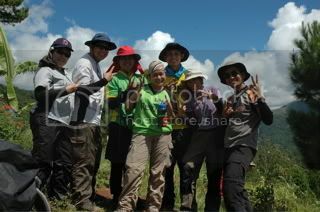 the trainees appreciated the experience, cold rain and tey's revenge included. there's not a lot of bad that you can say about mount ugo, and the experience she promises to give you, provided you regard her with the respect she deserves, is precious. at a quarter to 9, most of my group hurried towards victory liner, while pie, kim, jay, glenn, and myself, decided to stay behind to chill out, in a way. i decided to take them again to kaffeklatsch. since it was glenn's birthday, he bought us pizza, beer, and coffee. there was a couple playing in the café, and finally, i got my chance to sing. i chose stevie wonder's "knocks me off my feet", although, very honestly, i think i gave the guitarist a difficult time chasing my tempo. before we noticed it, we were running out of time, we had less than 15 minutes to rush to the bus station, before our seats are given out to chance passengers. nevertheless, we made it just in time, and even before the bus left the station, i was already asleep. i woke up 4 hours later, already approaching the toll gates of the smooth NLEX. i got home in no time, and was asleep by 5am. that was some weekend. ey alman, ai here... thanks so much for all your help and insights.. camping is so much more fun with someone like you.. nuovo rich affectations and all!! 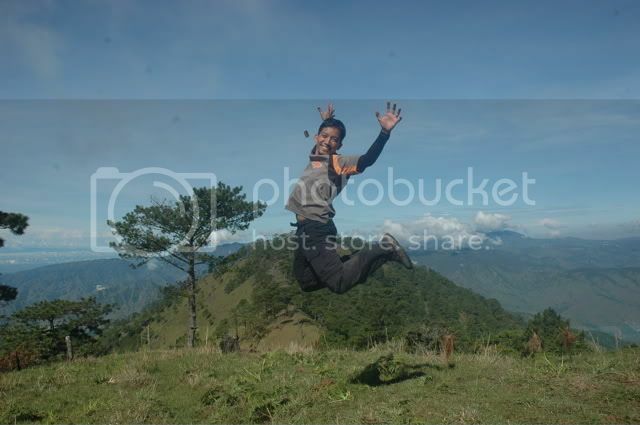 hehehe you are one true blooded mountaineer!